The clade Chiroptera includes two extant clades, Megachiroptera (Old World Fruit Bats) and Microchiroptera (echolocating bats). 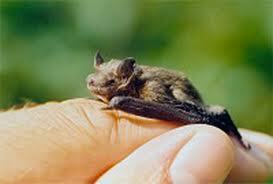 Bats vary greatly in size. The smallest bat, Craseonycteris thonglongyai (Microchiroptera), weighs less than 2 g and has a wingspan of 12-13 cm, while the largest bats, those of the genus Pteropus (Megachiroptera), weigh up to 1.5 kg and may have a wing span over 2m (Fenton, 1992). Check out the Visual dictionary: Bat Morphology for a more visual aid to localise all these bodyparts. Kirsch, J. A., J. M. Hutcheon, D.C. Byrnes &;B. D. Llyod. 1998. Affinites and historical zoogeography of the New Zealand Short-tailed bat, Mystacina tuberculata Gray 1843, inferred from DNA-hybridization comparisons. Journal of Mammalian Evolution 5(1): 33-64. Simmons, N. B. & J. H. Geisler. 1998. Phylogenetic relationships of Icaronycteris, Archeonycteris, Hassianycteris, and Palaeochiropteryx to extant bat lineages,with comments in microchiroptera. Bulletin of the American Museum of Natural History, 235:1-182.